Posted on Thu, Apr 14, 2011 : 12:43 p.m. Best-selling author Charlaine Harris will appear at the Michigan Theater in Ann Arbor next month for a special public Q-and-A session cosponsored by Nicola's Books. It's the finale — and the only Michigan appearance planned — for a publicity tour surrounding the release of her upcoming novel "Dead Reckoning." 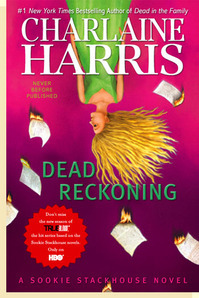 The book, on sale May 3, is the 11th installment in the ultra-popular Sookie Stackhouse vampire fiction series, which is the inspiration for the HBO phenomenon "True Blood." Harris will appear Monday, May 16 at 7:30 p.m. at the Michigan Theater, 603 E. Liberty St. in Ann Arbor. The event will include a public discussion and book signing. Tickets go on sale Friday, April 15 at 10 a.m. and are available in four price tiers: premium access to the front of the book-signing line, special reserved seating and an autographed copy of the latest novel for $38.50; special reserved seating and a copy of the latest novel for $28.50; special reserved seating only for $15; and general seating for $12. Tickets will be available from ticketweb.com or by phone at 866-468-3401..
Last year, Harris' novel "Dead in the Family," of the same series, sold 200,000 copies in its first week on sale and debuted in the #1 slot on both the New York Times and USA Today best-seller lists. In October 2008, she became the only author to have an entire series place on the New York Times best-seller lists simultaneously. There are currently more than 20 million copies of the ten-book series in print. The event will be the finale of a nationwide tour for the new novel. Harris will discuss the new book and popular series, followed by a moderated audience Q&A. A book signing will follow for anyone who purchases the title through the advance ticket offer via ticketweb.com or from Nicola's Books on-site that evening.